For the BSO’s week-nine subscription concerts, Andris Nelsons concatenated three seemingly disjunct works into a seamless, and mostly gossamer and timbrally resplendent, moebius strip, starting and ending with representation of night or chaos or entropy. In the Symphony Hall concert this reviewer attended Friday afternoon, offstage players labored effectively in two of the works, organ pealed, theremin wailed, and a famous fiddler provided some free-verse tone poetry. Derek Bermel’s short but episode-packed Elixir (2006) begins in a mystical jungle with canaries offstage, rain effects, and sleighbells, before bucolating into a choral-like affirmation in the strings. A hooting theremin entered with its haunting Day the Earth Stood Still wails. The strings continued rocking the cradle while insectivorous sounds from offstage threatened to overwhelm, in a relentlessly slow build. Taken separately, the string parts and assorted chirrupings and percussion novelties might test patience. Taken interactively, they found welcome receptors in charmed ears, and the gradual fadeout of the attractive sonorities left behind heightened sensibilities. Is Stalin ever absent from the music of Prokofiev? Such considerations come close to dialectical materialism without the materialism. In the Second Violin Concerto we again note the love of contrasts, echoing: Capulets vs Montagues, frightening 13th-century German hordes vs Nevsky’s lovable classless heroes, sophisticated modernism vs patriotic agitprop—it’s almost like Schumann’s Florestan and Eusebius. And the extent to which the composer borrows from himself makes him at once recognizable. 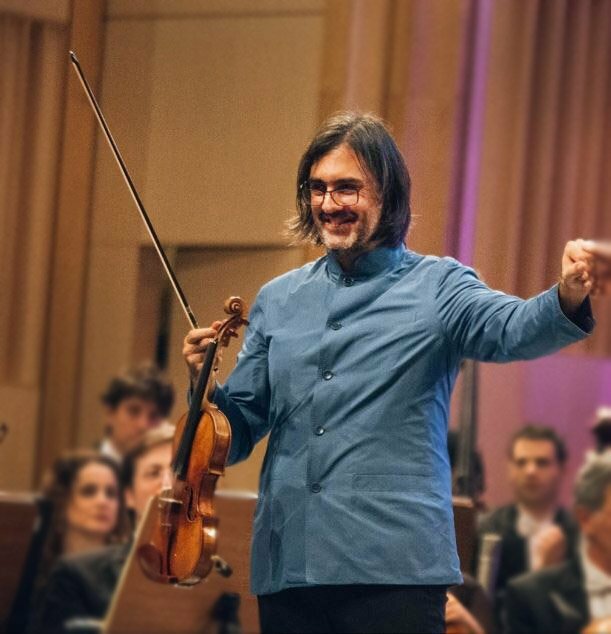 Initially detached and imperious of both mien and tone, as befits a string god, Kavakos warmed into the opening violin aria on lighter-than-air wings of song. No treacly goo cemented him to Earth. The musician is fascinating to watch. A grand-manner grip makes his wrist look less tortured than most violinists. His powerful bow arm is inerrant, while the left hand is particularly expressive. Nelsons gave him all the time and space needed for this modern Mercutio to tell his story, point by distinctive point. Troops, lovers, nostalgic longings, and forebodings of terror all marched by in clear-eared and clean-armed perfection. Kavakos bravely projected a sinewy and precisely focused but not overly large sound, rather than digging in for relentlessly broad but less subtle effects. He demanded no spotlight. Well-judged rubato, expressive and highly varied vibrato were two small but sovereign arrows in his distinctive interpretative quiver. His dead-nuts intonation, like that of Heifetz, Milstein, and Kremer, permits effective projection even in quiet expression. In the big cello tune at the end of the second movement, it was sad to see Martha Babcock in a distant chair rather than the center of her section. Don’t fade away, Martha. By the time Richard Strauss finished his last poem tome, An Alpine Symphony, in 1915, his gestures and phraseology had become predictable, and he never had occasion to return to the genre. For some, the work is little more than a masterclass in orchestration. Yet the expert advocacy of Nelsons and the freshness and engagement of the players almost redeemed it for me. Since it sounded at least to this listener much more rewarding to play than to hear, I buttonholed a violist during the Alpenglow. FLE: I gather from what I read in your faces, and heard, that you really enjoyed the Strauss. Violist: The Alpine Symphony demands a lot of all of us. It’s a concerto for every member of the orchestra and it made for an extraordinary climax for our summer. Did you get tired of all the tremolos and 16th notes? We joked at rehearsal that we should execute them with some sort of appliance strapped to our knees to give our wrists a break. Do you find Andris Nelsons’s stick especially clear and helpful? What he does with his entire body, and the way he talks with us, both really inspire us. Strauss leads us through 22 stanzas, or scenes, of vivid coloration, beginning and ending with depictions of Night. In between, we hear approximations of Sunrise, The Ascent, Entry into the Forest, Wandering by the Brook, At the Waterfall, Apparition, On Flowering Meadows, On the Alpine Pasture, Through Thickets and Undergrowth on the Wrong Path, On the Glacier, Dangerous Moments, On the Summit, Vision, Mists Rise, The Sun Gradually Becomes Obscured, Elegy, Calm Before the Storm, Thunder and Tempest, Descent, Sunset, and Quiet Settles. We needed no tour guide or surtitles to explain this journey. The composer’s use of cowbells to evoke an Alpine pasture might have constituted cheating, although he had no trouble imitating cuckoos without special devices. Transported we were at the start to an amorphous Night, somehow simultaneously suggesting Haydn’s chaos in the opening of Creation and dripping Rhinemaidens, that is until a single ping of the glockenspiel placed us in Strauss’s particular realm. Schemmer wondered if Strauss had been making affectional allusion to Wagner or whether his resorting to similar orchestral and harmonic techniques had been subliminal. When a bass drum / chariot delivers Sunrise, it seems to be driven by the Marschallin, so redolent is the moment of Rosenkavalier, from but five years earlier. In the three-quarters of an hour that ensued, a feldmarschallisch Nelsons summoned virtuosic execution and achieved exquisitees of orchestral refinement and color that leapt off the page. Many short solos attracted attention over the span of countless climaxes. Aaron Schuman’s brilliantly inerrant trumpet gleamed in its considerable exposure. [The] organist Brent McGuire both pealed forth and underpinned, although the shed’s Aeolian Skinner does not quite live up to the composer’s expectation for impact. [The] oboe Summited in timbres at once complex and romantic, producing perhaps the long-seeming work’s most heartstopping moment. To be sure, every section distinguished itself in this supreme test. The well-exercised strings never tired nor lost sheen. The winds parlayed piquancy onto scenic impasto. The busy and virtuosic brass frequently pinned the needle on my dBSPL meter at 95. Then a brief discussion among the horns: it seems that Strauss insisted the 2nd and 4th hold an F for 24 measures through the agency of a pneumatic assistant called the Aerophor. One wants to know whether the TMC horns managed this feat with circular or staggered breathing. Over the last several minutes of the fine but long coda, as Night persistently threatens to fall, Strauss keeps saying goodbye without leaving. When Nelsons did eventually drop his baton the players’ martial stomping (as in the Beethoven prior) attested to what will linger as a mountaintop moment in their musical lives. I share Lee’s enthusiasm for Kavakos’s playing, as I’ve indicated in previous reviews of performances both with the BSO and in recital. One of his remarkable attributes is indeed extraordinary intonation, and that tends to help sound project. Moreover, in contrast to the fiddlers Lee cites, he characteristically has a very large sound. I grew up listening to Heifetz and Milstein; their sounds cut through everything, but one would not have called them large. Given all that, I found this weekend’s Prokofiev a bit disappointing. I attended the open rehearsal (with an almost full crowd) last Thursday when they did a complete run through before touching up some spots…and listened on the radio last night. Perhaps befitting for a rehearsal, I felt everything a bit careful and metronomic, but in addition his sound didn’t soar or cut through, particularly at times when the orchestra was hard at work. This was in striking contrast to his Bartok performance with the BSO three years ago when I sat in virtually identical seats, about 15 rows back in the orchestra [My review is here]. It may be a function of the violins, or more likely that his new Strad was out of sorts and needs some adjustment. In 2014 he had the loan of a remarkable “Golden Period” Strad, created at least 20 years before the Willemotte, which is a very late example constructed when Stradivari was in his 90s (and often helped out by his less gifted, and certainly less industrious sons). But the late Strads are often glorious tonally, perhaps a bit less “soprano,” but sonorous…with tone sometimes referred to as a cross between a Strad and a Guarneri del Gesu. And finally, bows make a big difference! Roland is indeed our resident genius bow maker, and maybe all was different Saturday night. I wasn’t convinced over the radio, but very hard to judge. The performance seemed to lack the bounce and wit others bring to it. But an amazing fiddler!